We have many fandoms in our lives. From horror to Disney to Harry Potter, we love it all. One we don’t do a ton of recipes for but love nonetheless is comics. Matthew was especially excited when we were asked to come up with a recipe for Venom! In fact, he took the lead on this one and even created the recipe! Not only do we have this great recipe, but a FANTASTIC giveaway as well. Read on to find out more! For this recipe we decided to go the decorative route while making a delicious entree. 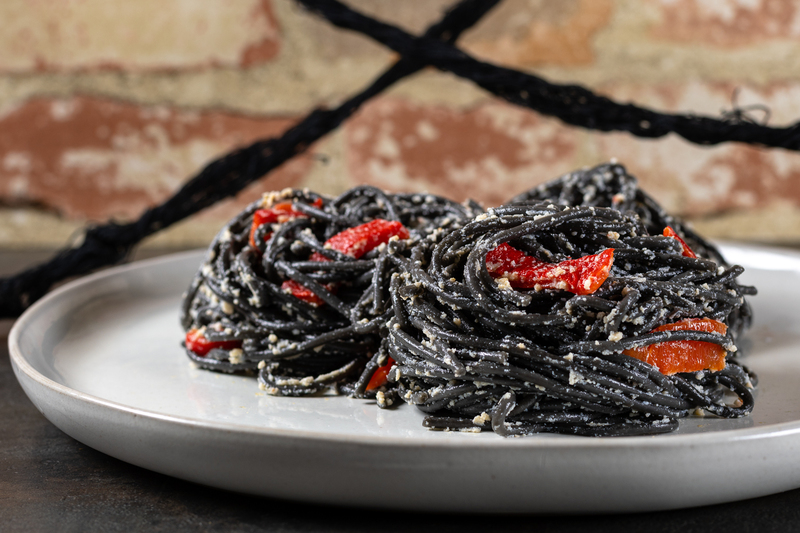 Squid Ink pasta may be super scary looking but it is actually quite delicious. 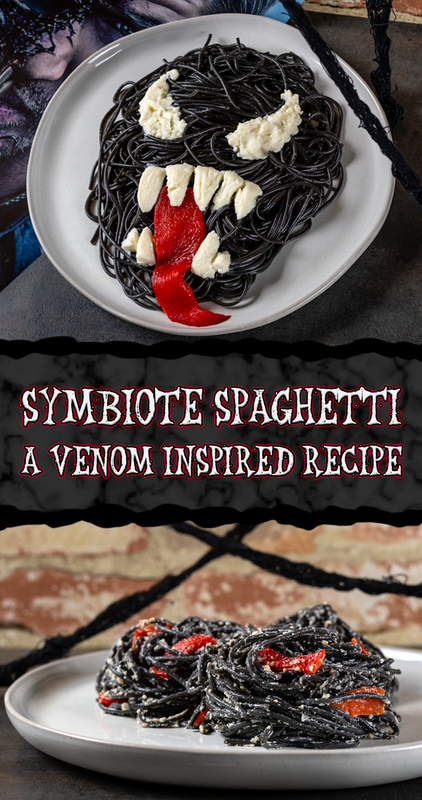 Our Symbiote Spaghetti is also really easy! We love being able to create simple but tasty recipes that utlize unique ingredients. Now its time to share our awesome giveaway! We are giving away 3 pairs of VIP screening tickets for a sneak preview! The screening will be held at Harkins Tempe Marketplace, on Wednesday, October 3rd. The screening starts at 7 pm and the winners should arrive at 6:15 in order to guarantee their seating. Winners will be selected on Monday, October 1st. Not only that, but 1 winner will also win a set of Venom: First Host and a $20 Gift Certificate to Fantastic Worlds Comics in Scottsdale! Good luck! Cut red bell pepper into thirds removing seeds and membranes. Place thirds on a foil lined baking sheet. Cook to 20 minutes or until outside skin is black and blistered. Remove skin, cut into desired tongue shape, and set aside. Cook pasta per package instructions. Toss pasta with olive oil and salt. 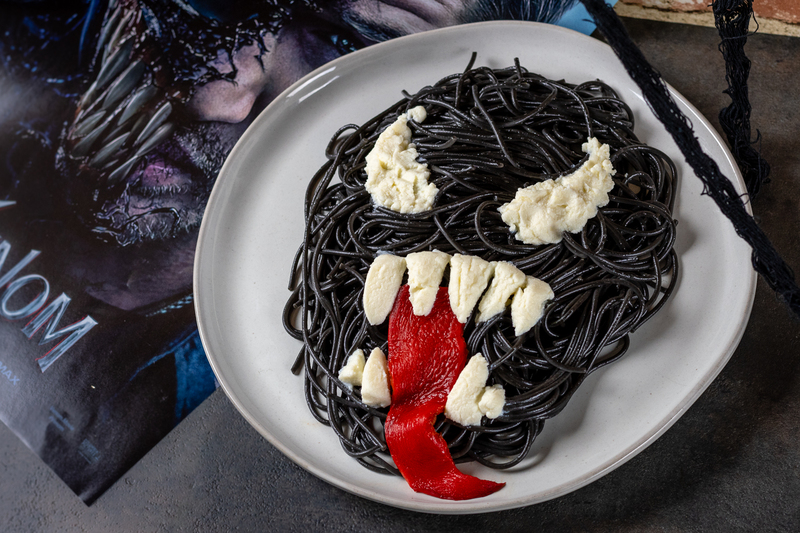 Use ricotta to create Venom's eyes and teeth. To create teeth: roll a small amount of ricotta between two spoons. 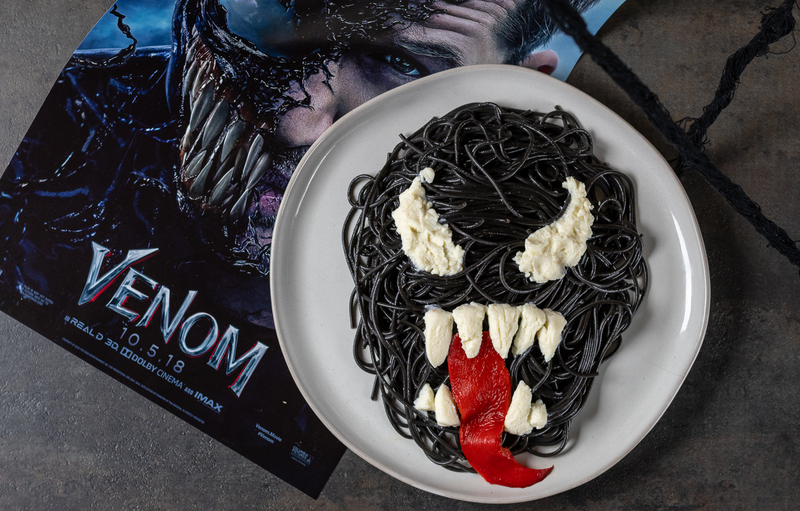 Place each piece on pasta shaped as Venom's head. Once ready to eat: cut the red pepper into strips and toss pasta with the ricotta and peppers. *The Geeks received no compensation to facilitate this write-up; opinions are wholly our own. Advanced screening passes provided by Allied Marketing and the comic and gift certificate provided by Fantastic Worlds Comics. View our Disclosure Policy for more info.